Super 13Cr series suit for the exploitation environment where higher well bottom temperature and more CO2 is destroying the normal tubing and casings. Any CO2 pressure, bottom hole temperature below 150 Centigrade. Any CO2 pressure, bottom hole temperature below 170 Centigrade. Any CO2 pressure, bottom hole temperature below 180 Centigrade. Any CO2 pressure, traces of H2S (below 0.01MPa). Plastic or Metal Pin and Box Protectors. Additional Third Party Inspection can also be performed on request. Standard Met︰ We provide 13% Chromium grades and Corrosion Resistant Alloys (CRA) for oil and gas operations in highly corrosive environments where carbon pipe cannot be used. In most conditions when the partial pressure of CO2 is above 30psi, carbon steels present high corrosion rates. Steel grades alloyed with high contents of Chromium (Cr), Molybdenum (Mo) and Nickel (Ni) are able to effectively resist corrosion. We manufacture 13% Chromium tubular products in our mills. We supply Corrosion Resistant Alloys through our worldwide alliance. The development of ultra deep gas wells and enhanced recovery of oil and gas implies more aggressive environment, with higher downhole temperatures and corrosive gases. Our group of 13%Cr alloys are martensitic stainless steels suitable for applications involving CO2 rich environments. 13CrS can be used in mild sour conditions. 13CrM and 13CrS have better performance with regards to corrosion resistance and excellent toughness. 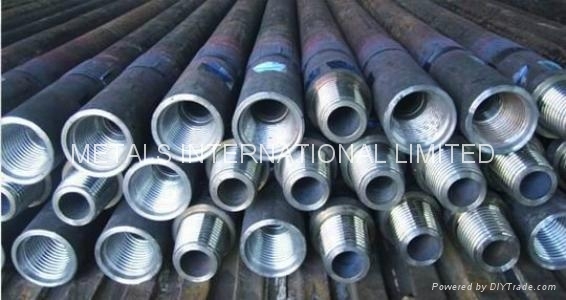 13Cr-L80 seamless tubes are used for oil well serving in resistant corrosive environment, which requires excellent quality of resistant corrosion and strength, also requires high precision of bend and size. CO2 -corrosion is one of the four main corrosion forms in oil-gas field and has become a very outstanding issue during the development of petroleum industries. Most of largest oil fields, rich in CO2 content, such as Daqing, Tarim, Changqing etc. now has been exposed to serious CO2 corrosion threat. The low alloy steel pipe we often used in the past now has faced serious corrosion condition, thus making us have to use corrosion resister. In the short run, applying corrosion resister is easy to operate and low cost, but it will lead to environmental pollution in the long run. Under this circumstance, we designed and developed the L80-13Cr anti-corrosion casing & tubing and got a very good effect. This kind of casing is designed for anti-corrosion of CO2 and has the excellent corrosion resistance performance. This product is non-API products, the produce and inspection standard of which exceeds the API requirements. These products use the 13 Cr steel, the chemical composition and the manufacturing process of which are reliable. This product has Independent intellectual property rights and will get the significant economic and social benefits. 2. By evaluating the electrochemical corrosion of the submission specimen as per ASTM G3 standard, we found that the surface of the specimen is capable of passivating and healing certain passive film. 3.Under the circumstance of simulated oil-field corrosion medium(1MPa CO2,90°C), we made the evaluation test of the submission specimen and found it has good corrosion- resistance ; The average corrosion rate is 0.054mm and 0.156mm per year respectively under dynamic and static state; the surface basically render uniform corrosion and no serious spot corrosion.